» quicktime footage to contact sheet, automated in 2 steps you down with FCP? Contact sheets can be an incredibly useful tool to deal with tons of photos. For non-photographic types, these are sheets with lots of little thumbnails on them to quickly show a lot of images. One little-known use is to use them to show stills pulled from a video. This can help to show clients / account managers footage without forcing them to watch hours and hours at a time. 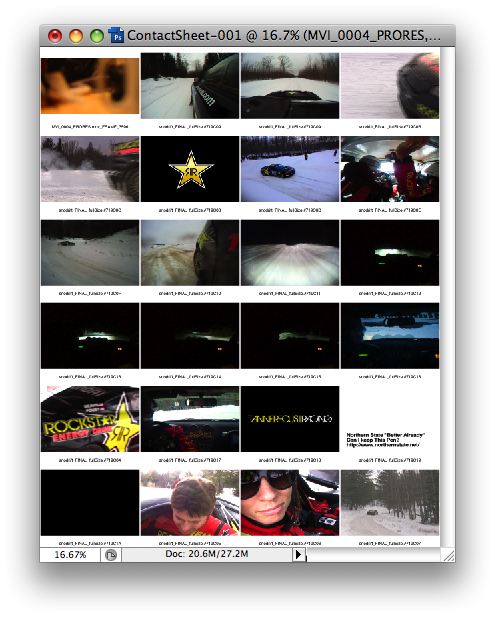 It can also be really useful to quickly find out what take the skiier landed the trick, or pick the best lit scene. Enough about the benefits of this, here’s how to create them. I made an applescript that will take any quicktime clip and spit out stills based on whatever interval you decide. You can download it here. It will label the stills with their frame number too. Here it is explained in pictures. To kick it off, drag one or more movie files onto the applescript. 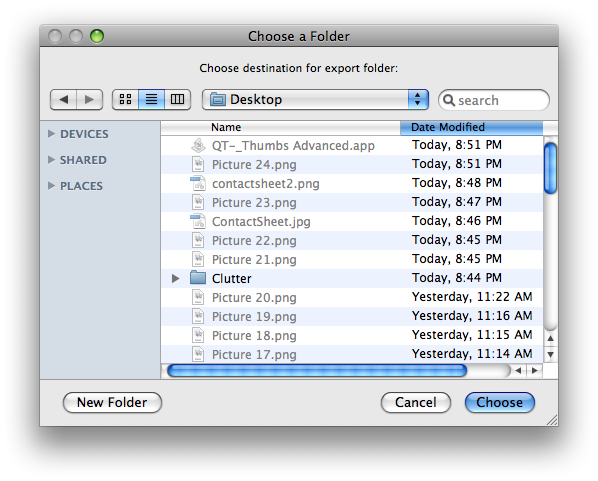 Select a destination folder for the images to sit in. It is generally a good idea to make a new folder for this, as it will generally be a large number of photos. Type in the base name for your exported files. A shorter name here is easier to fit on the contact sheet. 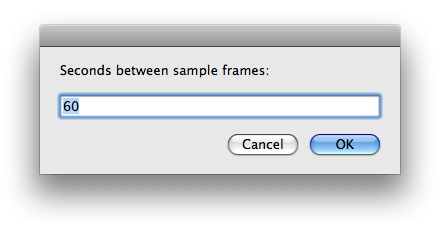 In the last step, select the interval between stills. It defaults to 60, or one photo a minute. If you have a different need, feel free to change it! When you hit Ok Quicktime should jump to the first interval and start exporting files to your destination folder. 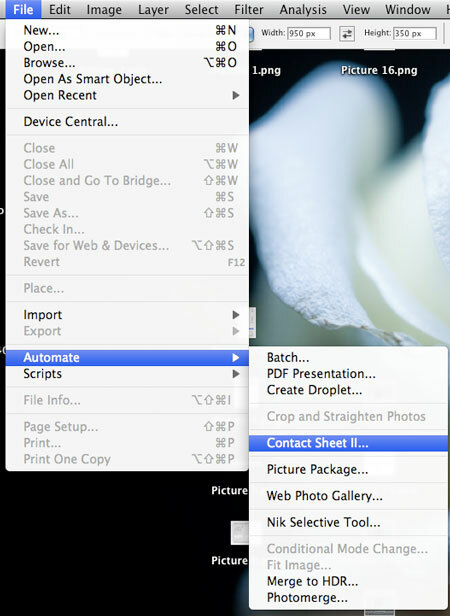 Next up, load all of the photos into photoshop using the contact sheet II option under file>automate. 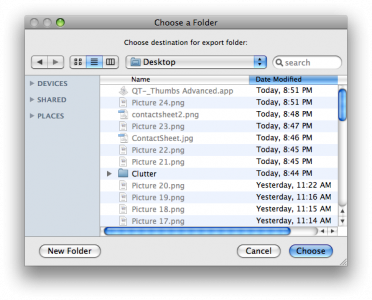 Pick whatever options you want for # of pictures and layout, and select your source folder. 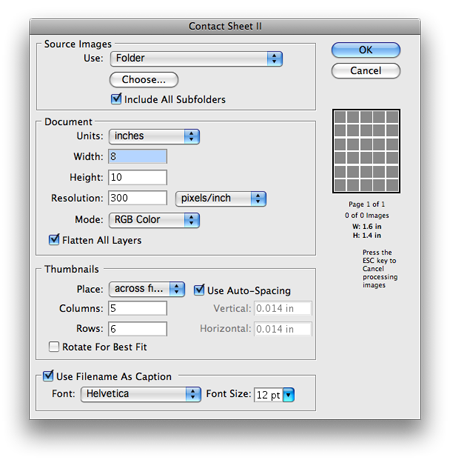 Once photoshop is finished you can print your contact sheets out, or print them to pdf and save them for emailing. One Note: The files have the frame number appended to the end of the name. To see frame numbers in quicktime, just click on the clock to the left of the play bar. A little menu will pop up, and you can select frames. 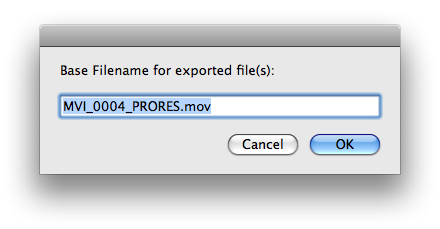 Now you can directly relate the filename to the section of the footage. Let me know if you end up using this, and tell me if there are any features you would like to see added! ~ by ross on January 11, 2010. I really like the tutorials you have on the site! This seems obvious now, but the script works perfectly in QT 7. The problem is with QT X – AKA the stripped down upgrade OSX defaults to now. Great script! Thanks for the work. Download link is down. Would love if someone could post a mirror. Hi Brian, I fixed the link. Also, I tried it for the first time in snow leopard and it got caught up somewhere. I’ll look into it and try to put up a snow leopard compatible version here soon. I’m a bit late to the party with this, but is anyone else having trouble with thing? For a 30-sec clip with 5 sec intervals exported/transcoded to .mov from FCP (6.0.6), for the sake of argument, I get six screengrabs with the last frame of vision! But with other .movs I get the correct frames for the interval. Is it me? The site’s very cool by the way and thank you for this and the other scripts you’ve published here. Is there any clarification to the issue I mentioned above? I’ll look into it Ray. Sorry, I had missed your comment. Thank you, Ross. Let me know!